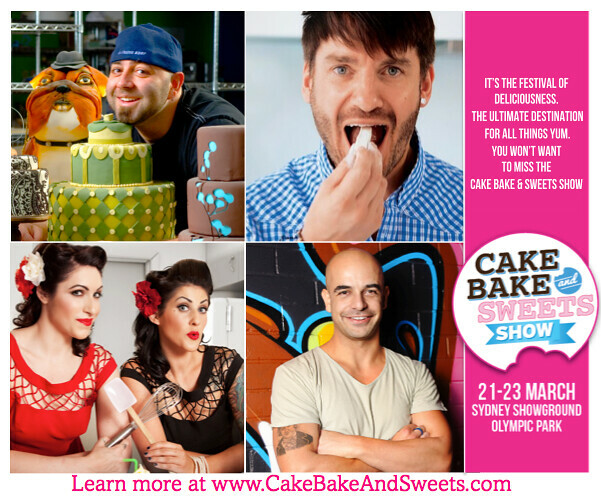 Giveaway: 4 guest passes to the Cake, Bake and Sweets Show, Sydney! If you love cakes, baking and sweet things just as I do, then you’re going to love my latest giveaway! I have four passes to give away to four lucky readers to visit the Cake, Bake and Sweets Show in Sydney! Packed with loads of goodies for fans of all things sweet, this show is the perfect Comic-Con for bakers, a must for all all the baking nerds at heart. The CBS show is packed with goodies for keen bakers such as free cake decorating tips demonstrated by top bakers in the Cake Decorating Theatre, tricks on baking and the art of bread-making in the Devondale Bakery Theatre and dessert demonstrations by talented pastry chefs (including the lovely Anna Polyviou) and much, much more! 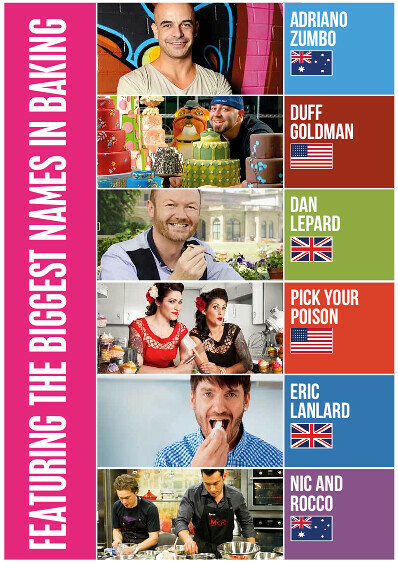 For all you fans of baking TV shows, you’re in luck! Duff Goldman (of Ace of Cakes fame), Adriano Zumbo and Dan Lepard as well as MKR and Masterchef ex-contestants will also be in the house demonstrating their epic baking skills. Simply leave a comment at the bottom of this post with what your favourite baking goodie is, like Cooking Crusade on Facebook and you’ll be in the running for your chance to attend this fabulous event! You can also gain bonus entries by following me on Twitter and tweeting about the giveaway. You can tweet about this prize daily for extra entries, but don’t forget to enter your entries into the RaffleCopter!! This Giveaway is sponsored by the Cake, Bake and Sweets Show. Check out their website here! Oooh good choice Annie. Chocolate chip cookies are one of my all-time faves to bake!! My favourite baked goodie is a rich, moist Black Forest Cake. Layer upon layer of chocolate sponge, soaked sour cherries, delicious whipped cream, chocolate curls and oozing chocolate ganache just to make it that much richer. My mouth is watering. My favorite goodie to bake is caramel slice. The best is when it’s freshly baked & the caramel is still slightly warm! Oh wow, I adore caramel slices too but I don’t often eat them fresh like that. Divine! Thanks for entering! omg I neeeeeeeds to go to this! all the cake! My favourite baked good is my sticky date puddings which are moist and gooey and perfect with a scoop of ice cream! Hahah what a nice partner you are, I hope you guys win tickets 🙂 Thanks for entering Andii! Vanilla bean panna cotta with fresh strawberries! Oooh what a beautiful sounding dessert. Thanks for entering! My favourite baked treat is your basic self saucing pudding. Mainly because it’s super easy to make and even easier to eat! My favourite baked goodie is salted caramel cookies 🙂 yum! Dayumm those sound GREAT! I would love to tuck into a bowl of those right now hehe! Thanks so much for entering Alison! Nothing beats a sponge cake with the perfect texture, covered in in season strawberries and whipped cream. I am sucker for the classics. I love a good choc chips brioche! My wife Anna is a real foodie.She watches show, buys new products buys cookbooks and food magazines and attends all food and wine shows. She would love to learn even more as she is always baking and creating treats fo all our family and friends to enjoy and savour. My favourite baked goodie is definitely little Lemon meringue tarts. My Mum use to make them and even today the aroma and flavour brings back so many fond memories. I love small white chocolate and raspberry baked cheesecakes. I love the variety of textures and flavours. Delicious!!!! I love tangy yet deliciously sweet Lemon Meringue mini pies as they bring back so many fond memories of my childhood as Mum would make them for us. Learnt this when I was 14 and have used it ever since ! my favourite baked goodie is my mums apple and blueberry tea cake…. it never fails!! deliciously golden and crunchy on top, soft on the inside!! Cupcakes! Never try to tell me they are just a fad! I’ve been baking them since I was little and I’ll bake them to my dying day. So many variations to try but the one I just pulled out of the oven an hour ago are pretty yummy- blueberry, almond crumble! My favourite baked treat at the moment is orange and poppy-seed cake – would sweet orange syrup over the top! My favourite baked good would have to be the dark chocolate pear and pistachio cake I made for my girl friend on Valentine’s day a few years ago. Her sister thought the cake was from Black Star 🙂 I surprised myself how well it turned out. When you do things with love the results speaks for themselves. A special occasion treat is making a rich flour-less chocolate cake with the kids, savouring a warmed slice with a dollop or two of cream, ice cream and strawberries. My favourite baked goodie is A Wagon Wheel Slice! I adore these so much! My mother used to make them, now I make them for my family! I have a VERY sweet tooth, love baking and would ADORE attending the Cake, Bake and Sweets Show in Sydney! Please consider my entry. Thank you!